For once, we will not really eat in this article. We’ll just chew. The subject of the day is betel, a vine originating from South East Asia. The leaves of this evergreen creeper plant have medicinal properties. They are chewed along with other ingredients, offering an amazingly red, psycho-stimulating cocktail. Let’s have a closer look at it, in the small village of Banuang Daan. I’ve been living in a Tagbanua village for a few weeks. These people are the native tribe of the Palawan archipelago in the Philippines. Thanks to my local mum Joy, who is a man despite his name, I was accepted in the small community by the chief of the village, or the ‘Barangay Captain’ as he’s called here. Here, it’s behind the mountain, on the facing island, according to the inhabitants of the closest big city, which is itself a hole in the middle of nowhere. Banuang Daan, my Tagbanua village, it’s the edge of the world for the people who already live on the edge of the world. About 150 households, a lot of kids, a few men around because they’re always at sea, very few elder people because no one lives very long. No running water, no electricity, no telecommunications. In Banuang Daan, we live in the old-fashioned way. And we stick to it. The Philippines have recently started foring the Spratley islands, far to the West, and found some oil there. There is lot of money to make there. The local government has decided to give a part of that money to the poorest regions of the Palawan archipelago, which my village is part of. The idea is to develop the most rural zones. They’ve given a solar panel to the Tagbanua of Banuang Daan to provide electricity to the houses. The idea did not please everyone, apparently. The solar installation has been destroyed with rocks by local rebels. Same thing for telecommunication technologies. Don’t piss the Tagbanua. They have rocks. Here, people live by small means. They don’t eat very well. They usually have rice, noodles, sometimes dried fish. Fresh fish and seafood that the fishermen from the village catch are meant to be sold in the big city, as well as most fresh fruit, such as bananas or mangoes. They would lose too much money if they were eating those products instead of selling them. To have money… to buy other products. Yeah, makes no sense. That’s the beauty of development. Usually, the men of the village find me pretty, because my skin is pale. But as soon as they see me lighting a cigarette, they look absolutely disgusted and express it vividly. In Banuang Daan, women don’t smoke. 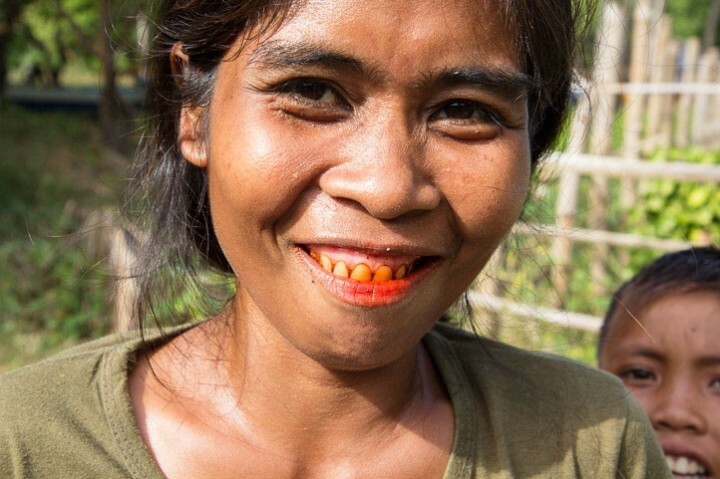 They prefer chewing betel or nganga, the local name, quite hard to pronounce for a Frenchman. For that, they use a betel quid, composed of betel leaves, slaked lime, areca nut and tobacco. I often see men and women chewing those funny things and spitting an overflowing red saliva. When they smile to me, their teeth are bright red. 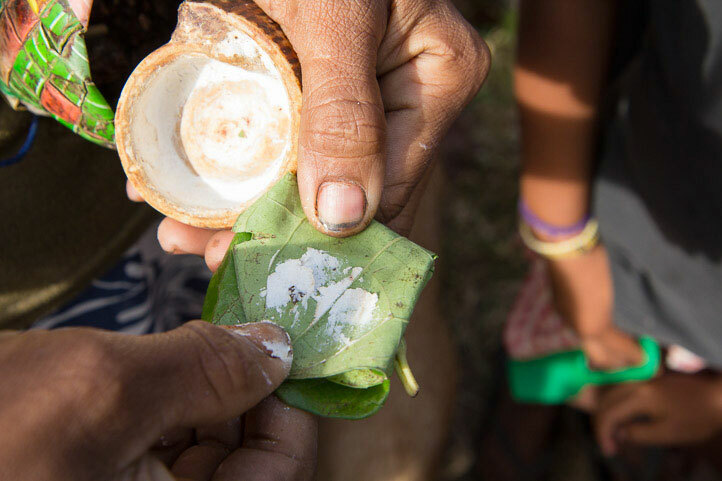 I’ve asked a woman to show me exactly how she was using the betel leaves. She was holding a little nipa box. 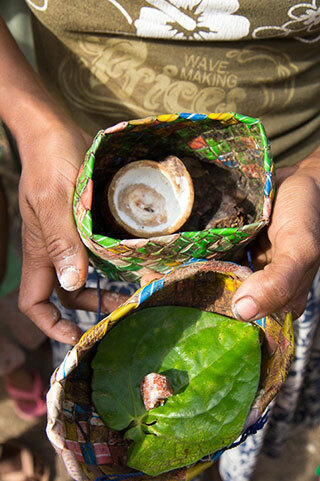 Inside the box, there’s a treasure: her betel quid. First, there are some betel leaves, which are shiny and acid-green. They are covered with slaked lime obtained by heating and crushing seashells. This ingredient is capital as it will keep the active ingredient in its alkaline form, enabling it to enter the bloodstream via sublingual absorption. Once the leaf is covered with lime, it is delicately folded to become a small cube that you can start chewing. At the same time, the woman bites a tiny bit of areca nut, which is the fruit of the Areca Catechu palmtree. It’s a stimulant, causing a mild hot sensation in the body and slightly heightened alertness. Well, don’t get your hopes up, it only has about the same effects as drinking a cup of coffee. 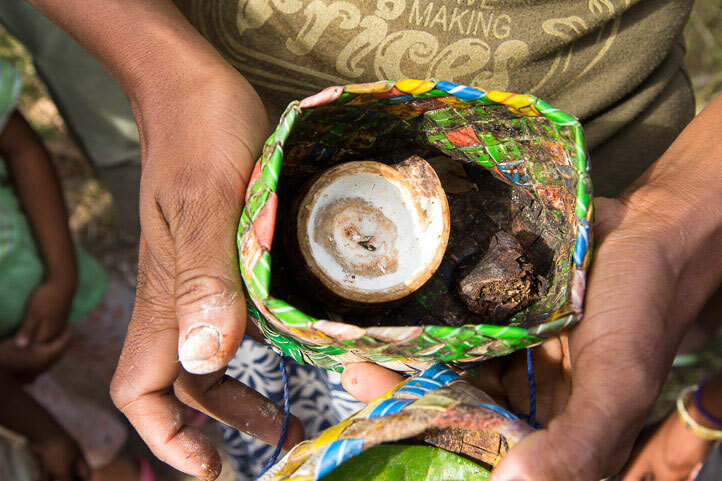 In my country, areca nut is used to make candies such as Cachou Lajaunie, a hard licorice, and also toothpaste. Indeed it is known for preventing tooth decay and it’s a good remedy against halitosis. In the betel quid, it’s the ingredient responsible for the red colour, and also the overflowing saliva. Last but not least, there is tobacco in the betel quid. In its purest form: dried leaves, tightly and perfectly folded. Those four ingredients are directly mixed in the mouth if the user. He chews them and spits the coloured saliva. 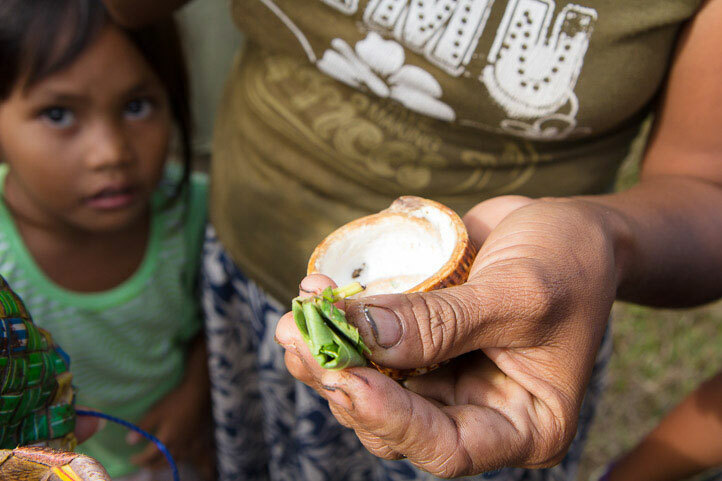 Toothpaste and cigarettes at the same time, betel has been used for thousands of years in the region. Forget about toothbrushes and smelly Marlboro, here people have the 2 in 1 solution. I haven’t tried the mixture yet because I’m not dying to get red teeth. And all the chewing leaves that the Tagbanua have made me try so far were so bitter that somehow I have lost my spontaneity to taste everything right away. There are still a lot of interesting things to discover in Baunuang Daan. I promise you’ll get some more soon.